FREE again – The Really Groovy Story of the Tortoise and the Hare, an updated version of the classic fable. 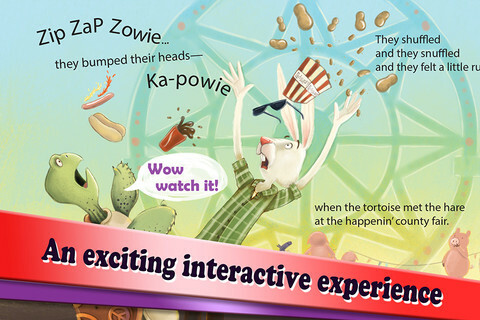 This fun rendition of the Tortoise and the Hare is set in modern times and told in rhyme. The app has two modes – Read to Me and Read by Myself. The Read to Me mode is professionally narrated. In either mode, kids will enjoy Christina Forshay’s colorful illustrations which fill the pages of this groovy tale. The story also features animations, sound effects, and background music – very nicely put together!